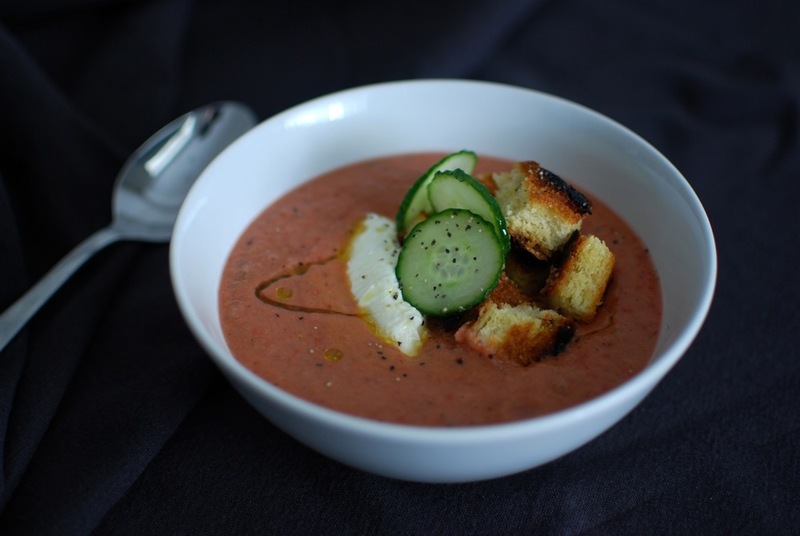 As it turns out, for a first-time-maker, hesitant-fan, of gazpacho, I’m rather a fan of this recipe; it beautifully salvages the season’s overripe strawberries, greens included, uses up a handful of day-old bread, keeps refrigerated or frozen, quick AND easy make ahead meal, perfectly refreshing in summer, won first place in last week’s canapés contest and last but not least, is a PROVEN gazpacho converter [myself included, now a huge fan, unbiased I promise]. Throw the freezer in there, and just think of the endless Strawberry Gazpacho reincarnations! Make sure you scroll all the way down to the bottom – ‘Consume’ – for some waste combating, while brilliantly festive and summer party appropriate, gazpacho applications. Basically it’s an all around winner. And it’s all thanks to a little online platform called Food 52 - you might have heard of them? A re-adaptation in fact, of their adaptation from the infamous Eleven Madison Park, for their cook book: Genius Recipes. Guess I should have figured they knew what they were doing... [And if you really have only maybe heard of Food 52… go get better acquainted. ASAP]. It’s been added to my summer recipe bestover repertoire. It should be added to yours. Try it try it try it now. SAVE THE STRAWBERRIES. Into a frying pan drizzle the oil, add peeled and crushed garlic clove, and heat until bubbling slightly. Add the thyme and bread pieces until toasty, then add to a bowl. Roughly chop all the other ingredients – now when it comes to the strawberries do not take off their green tops, toss them all into the bowl, NO WASTE - into the same bowl with the crouton cubes, being sure to remove stem and seeds of peppers. Liquefy with a hand blender until as smooth as you can get. This may take 3-5 minutes. Refrigerate for at least an hour, or overnight. While the gazpacho cools, make the crouton soldiers (or cubes, as you prefer): drizzle olive oil with the tablespoon of butter into a frying pan and heat until butter has melted entirely. With the pan on medium high heat, add the bread soldiers and thyme. Toss to coat and fry until crunch and dry, with a little char, adding a little butter/olive oil to prevent from burning, until you reach toasty crouton perfection. Serve with a dollop crème fraiche/strained yoghurt, croutons, thinly sliced cucumber, freshly cracked pepper, pinch of maldon sea salt, and drizzle of olive oil. For coeliac friends, try removing the bread both in and out of the gazpacho. The soup will be a little thinner, but flavour should not be affected though add a little less vinegar to start - adjust seasoning as needed. Replace bread-y croutons with gluten free crackers/bread of choice. Untested [as of yet]: fill your ice lolly/popsicle mold, and serve as a fun savoury ice pop at your next summer garden party.